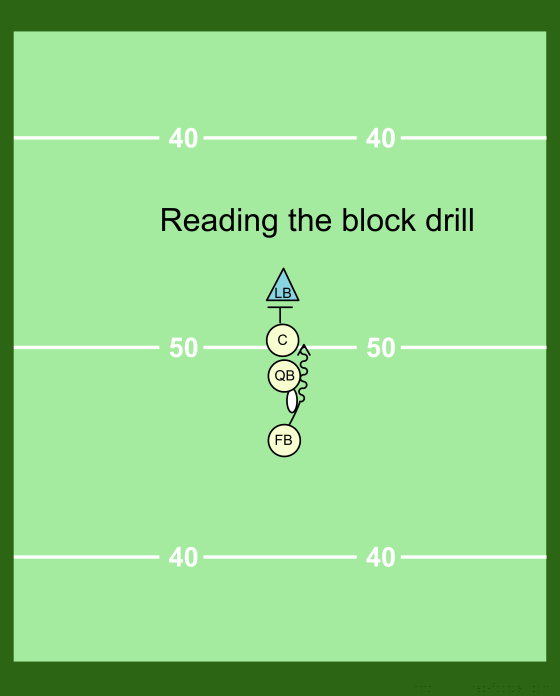 This drill is good for teaching running backs how to read their blocks. It also is good for teaching linebackers how to shed a block and make a tackle. The QB tells the FB if he'll go through the 1 or the 2 hole. Change it up each time. The QB gets to practice his handoffs. The C blocks straight ahead. The LB tries to avoid the block of the C and make the tackle. Early in the pre-season everyone takes a turn. Each position is assigned a number, FB - 1, C - 2, LB - 3. QB doesn't rotate. Players rotate 1, 2, 3 and then off. Later in the pre-season the players stick to their positions. We use tackling dummies on each side to create a lane and not allow the FB to avoid the tackle.